It's Time to Make Some Extra Money! OK, so this Time magazine cover featuring my picture is obviously fake, but I am excited that I got an article published on Time.com today! The article is about 21 times you can spend money to save money. You can read it here on Time.com. If you read my newsletter, you know that I am planning on making some extra income this year in addition to pinching pennies as usual. Last summer I decided to move beyond posting articles on my blog and see if I could get paid to publish articles on other sites. Sometimes I write about my dog. One time I wrote a fictionalized account of an interaction with my editor just for fun. I started a blog about coffee because I like coffee. 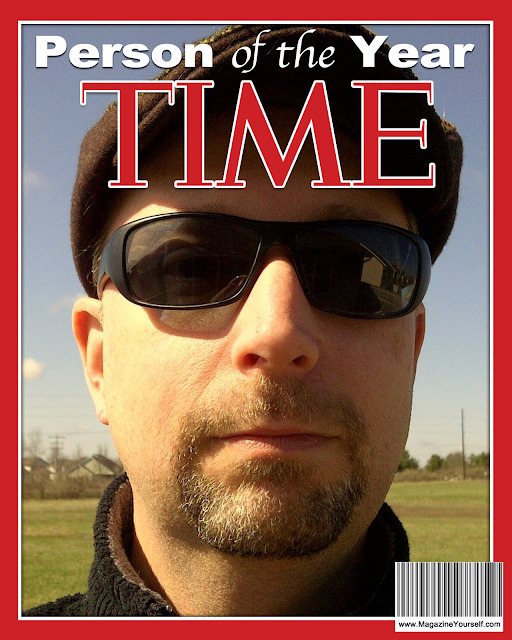 One time, I even thought of an article topic just so I could show a giant picture of my face on a fake Time magazine cover! There is no adult supervision at all, I can write whatever I want and it gets published immediately. I like the idea of owning something that has value. When I write articles and publish them myself on my blog, I retain all rights to the articles. I can make money for years from advertising. Sometimes I post new articles on my blog every day, or sometimes only a couple times per month. It is up to me, and no one seems to get upset if I don't post for awhile. Who doesn't like making some extra money for doing something really easy? From my family's perspective, it probably doesn't look like I am working very hard. They see my relaxing in my chair, looking out at the lake and messing around on my computer. Not a bad way to work if you ask me. Thousands of people read my blog, and that results in some nice income. But there are sites around that have MILLIONS of readers. I took some advice from Jon Morrow to go where the audience is gathered instead of waiting for them to find me. Publishing on an established site can be a quick way to reach a large audience. Selling an article gets you money up front, right away instead of waiting for money to come in over a long period of time from advertising revenue. It is not unusual for a blog to take many months to make the first few cents. Selling articles can bring in extra money much faster than that. Being published on popular sites that people know and trust helps build credibility with readers. You can check out my About Penny Pincher Journal page to see some of the places my articles have been published. Some of my articles are syndicated, so you can find them on a lot of popular sites around the internet. I have learned a lot working with editors as they suggest topics and work with me to refine my ideas for articles. I l review my articles after they are published to see what edits the professionals made to tune them up. You can find lots of advice around the internet on how to start a blog to make money. Most of this advice comes with links to sign up for web hosting and domain registration and courses, which all cost money. I ignored most of the advice and have gone with 100% free web hosting from Google on blogspot.com and use a free domain name as well. I might be able to make more revenue from my blogs if I were willing to spend more, but it sure is nice to have no bills to worry about paying for hosting my content. Publishing articles at HubPages is also free in the sense that you do not have to pay them, although they take a 40% cut of your advertising earnings. I think this is fair since there are expenses involved with running servers and promoting the site. Here's how to get started publishing articles on HubPages for free. After starting my blog, I have also published a few books. It is fun to get a check in the mail once in a while, and my free book generates interest in my blog. Here is an article I wrote on making money by publishing ebooks: Can You Get Rich Writing eBooks? Selling articles to other sites to publish is probably the fastest way to make money, but you will likely need to have some published articles as a portfolio in order to get hired to write articles. This is a catch-22. You can work around this problem by starting a blog, publishing some interesting articles, and then approaching other sites about writing for them. If you enjoy writing and have some patience, selling articles is a great way to do something interesting and make some extra money. Is it time for you to start writing articles and finding paychecks in your mailbox? Sign up for my newsletter- sometimes I share details about my writing projects and making money with my subscribers.